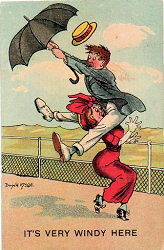 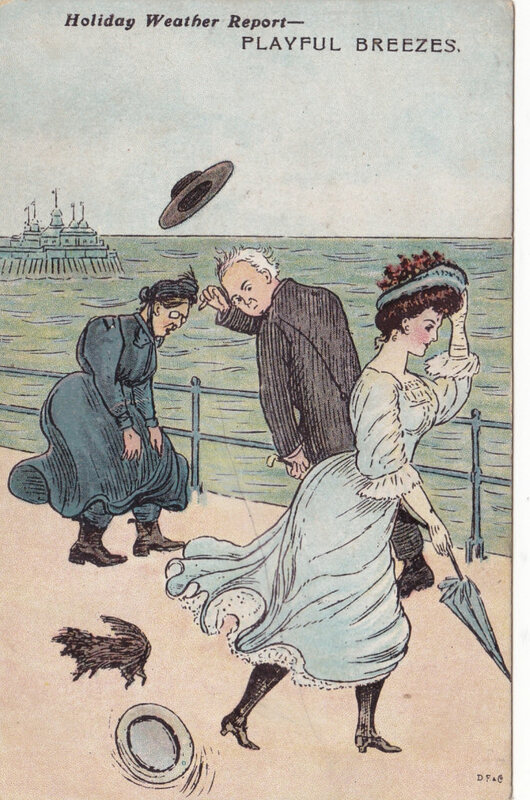 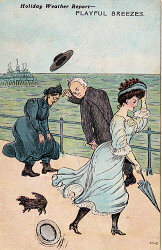 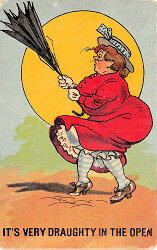 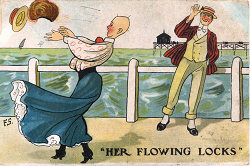 This card is one of a set of six cards by "F S", with a "Down Here" theme which was first published in 1907. 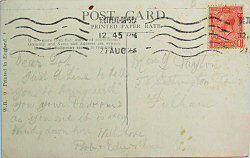 It proved very popular and was frequently reprinted - usually without the "F S" signature - and also closely copied. 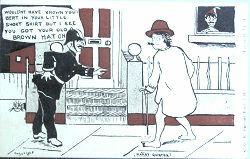 In particular copies were made by slightly later but very well known artists, "Comicus" and "Donald McGill." 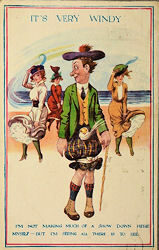 Below I give details of the known variations and would expect there to be a published bt the London View Co Ltd variation, and other named seaside resorts. 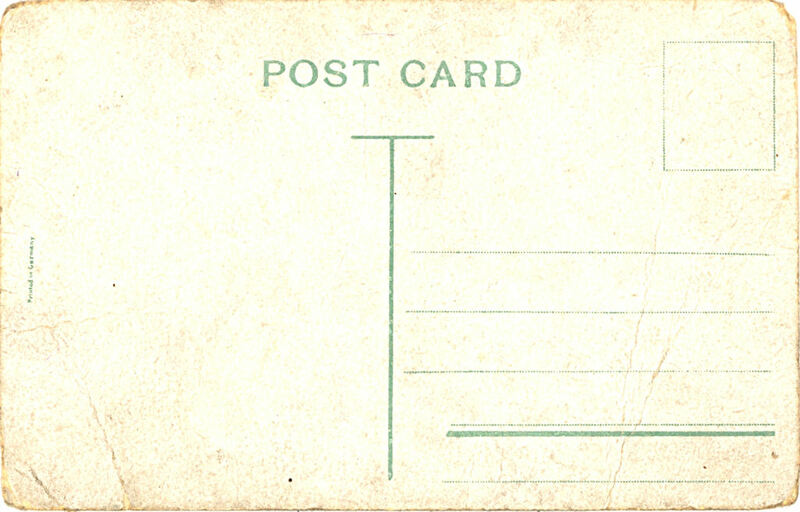 A number of "F S" related cards were reprinted about 1913 and in particular numbers 698 and 699 are also from the "Down Here" set. 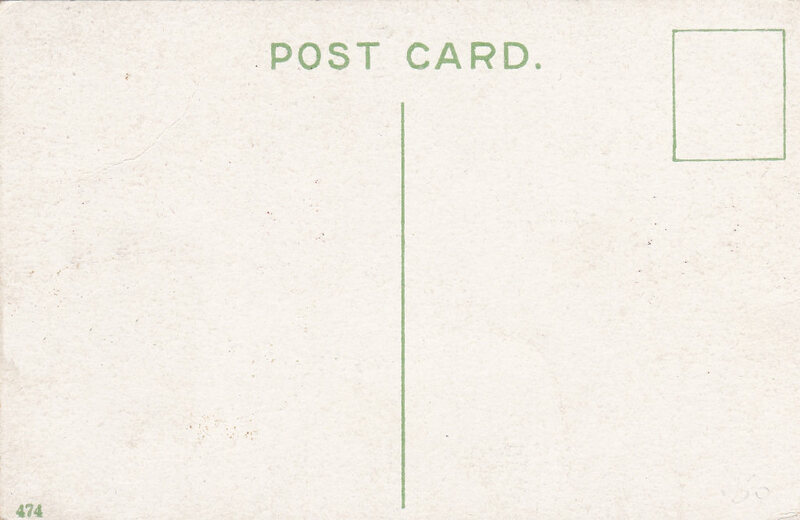 This is a redrawn mirror version of the basic card with trivial variations and with a place name written in. 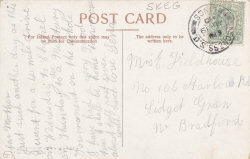 The back is not one I recognise as being linked to "F S" cards. 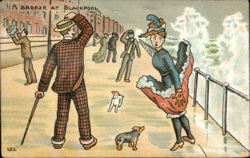 Possible Variations: With the name of other seaside resorts ??. This card is a differently coloured version of the previous card - and may even have been an experimental prototype, as it really is quite crude and impractical. 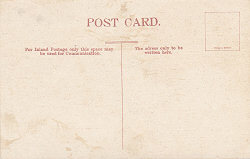 It has a large red translucent inset which take up part of the address space - and I have not seen this done in any other "F S" cards, or in any cards produced by the London View Company (Ltd). 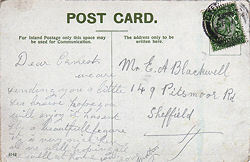 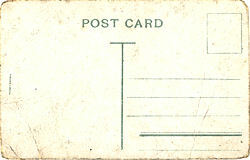 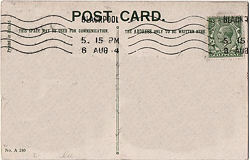 While the stamp box says the postage is a half penny the large hole in the address area suggests that the post office would not have treated it as a standard post card and charged 1d. 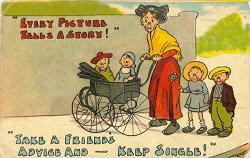 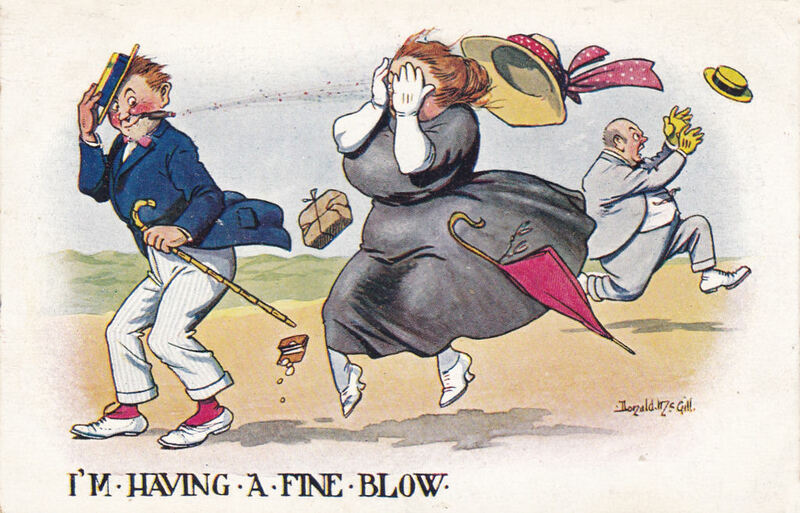 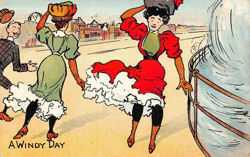 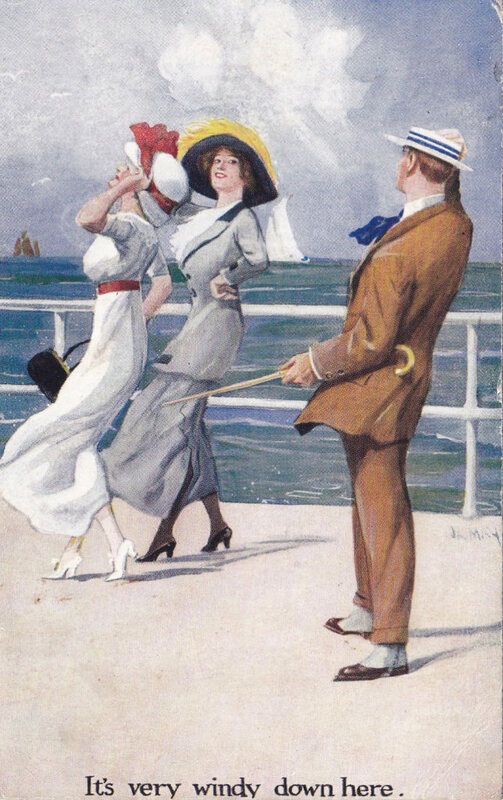 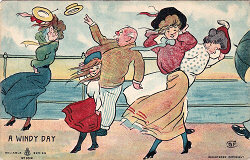 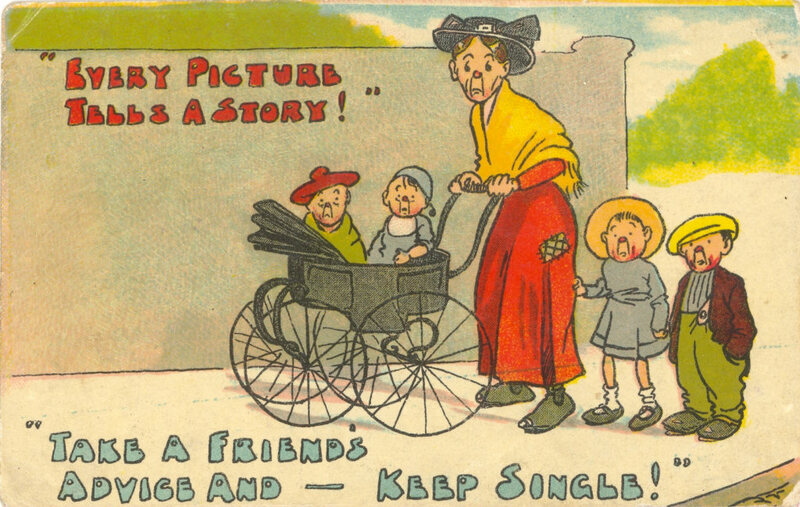 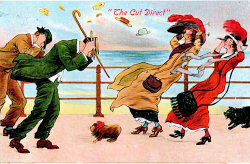 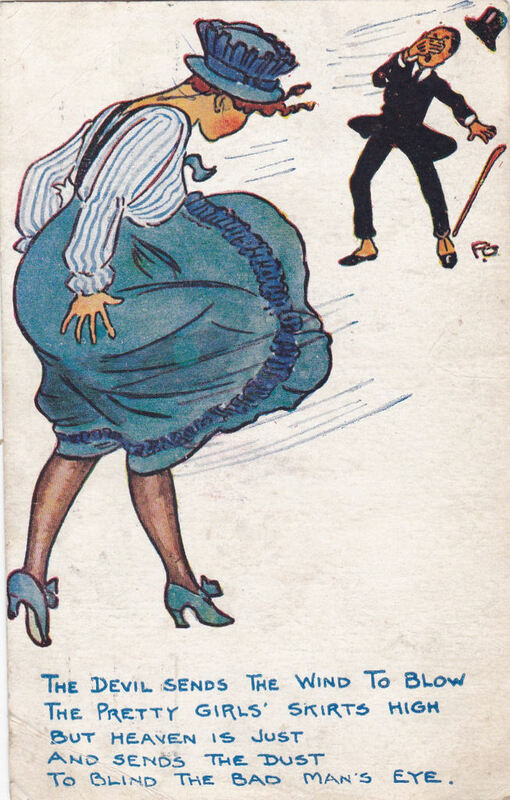 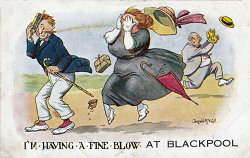 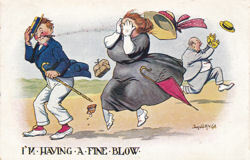 A Related card by "F S"
The figures are similar to the two people on the right in the "It is Very Breezy" card. 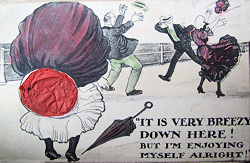 The caption has been totally rewritten and the later one links to the "Down Here" series. 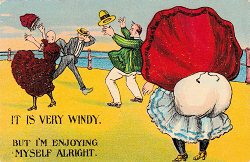 The backs (Early Saxony and Writing Space) suggest a different publishing history to the "It is Very Breezy" cards. 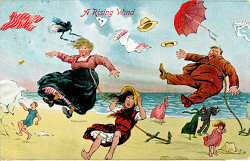 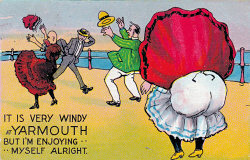 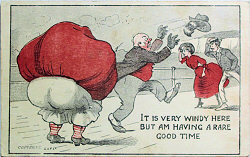 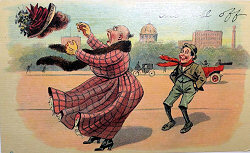 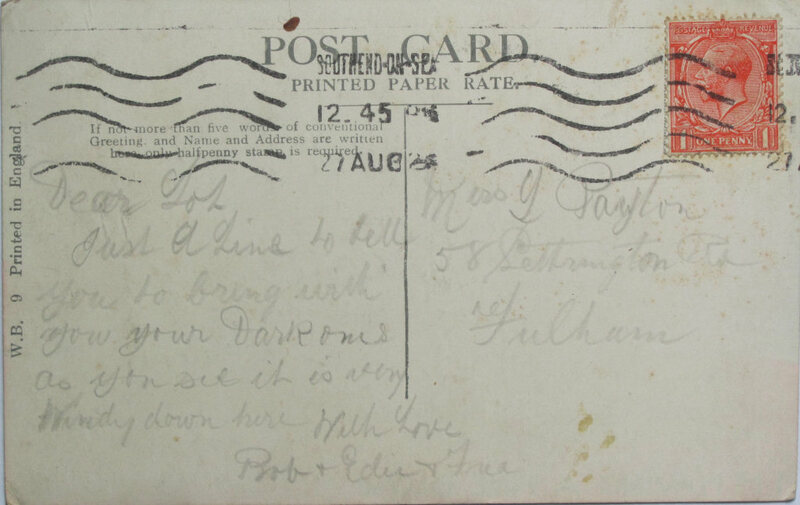 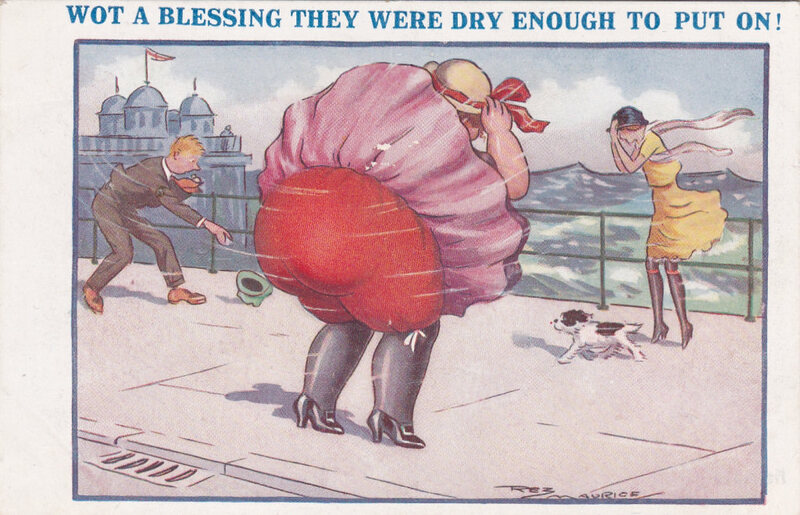 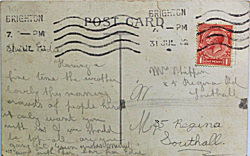 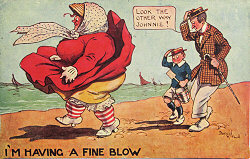 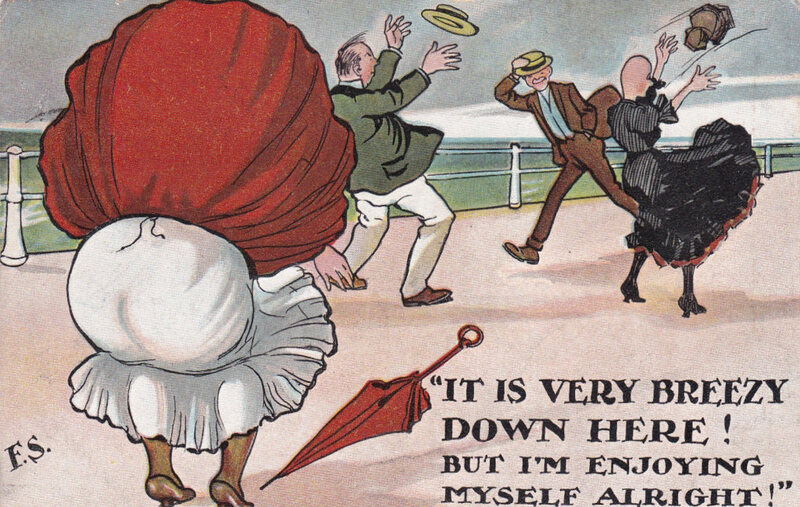 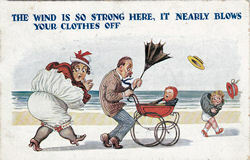 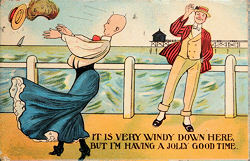 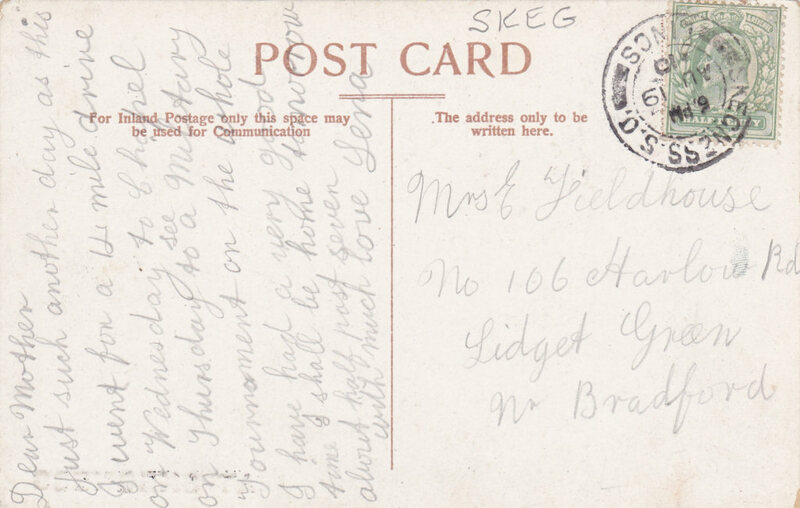 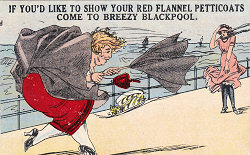 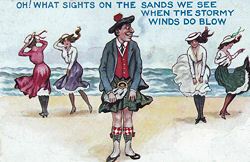 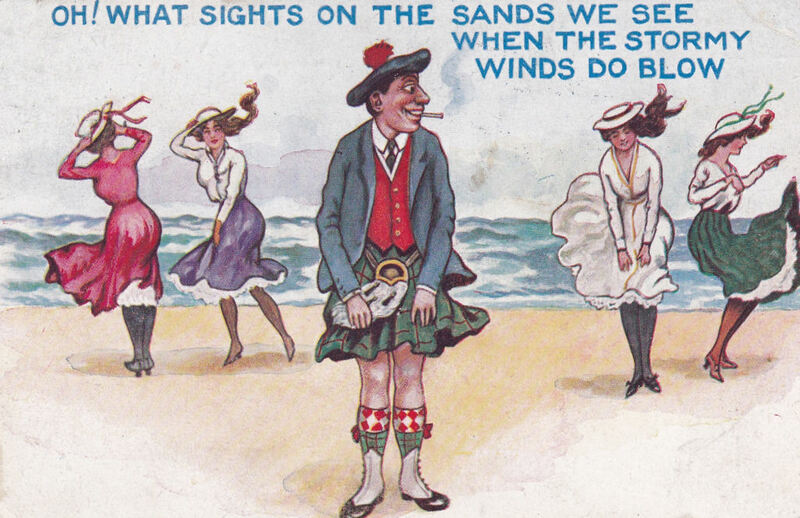 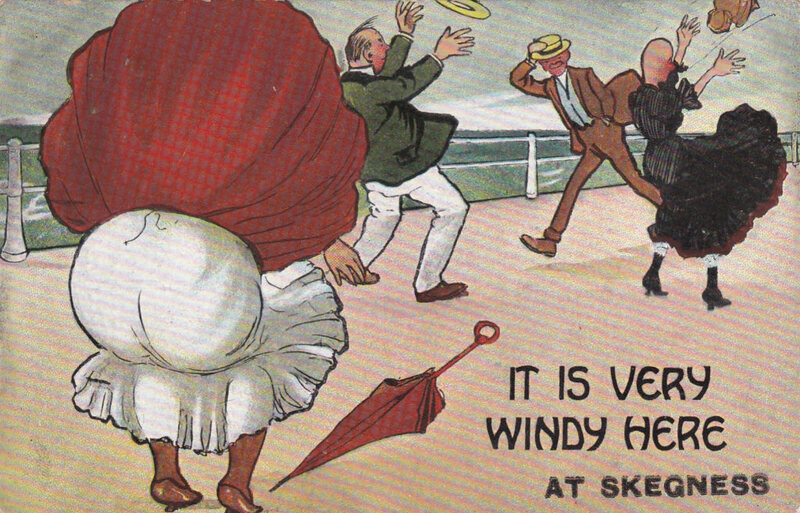 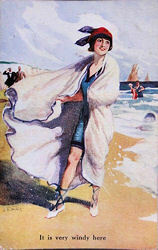 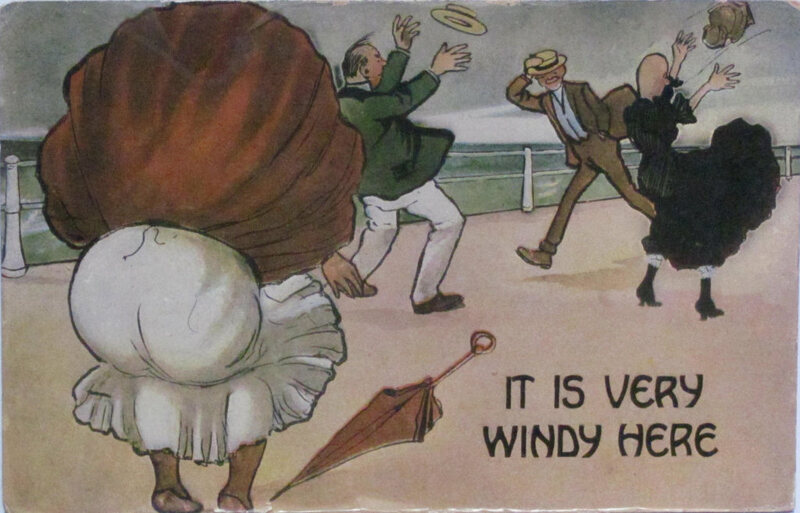 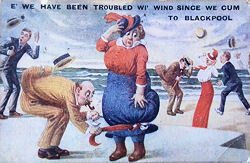 Some Redrawn Variants of "It is Very Breezy"
The number of versions of the original post card suggests that it was popular, and was reprinted a number of times, often with the "F S" signature removed, and changes in the text wording.. 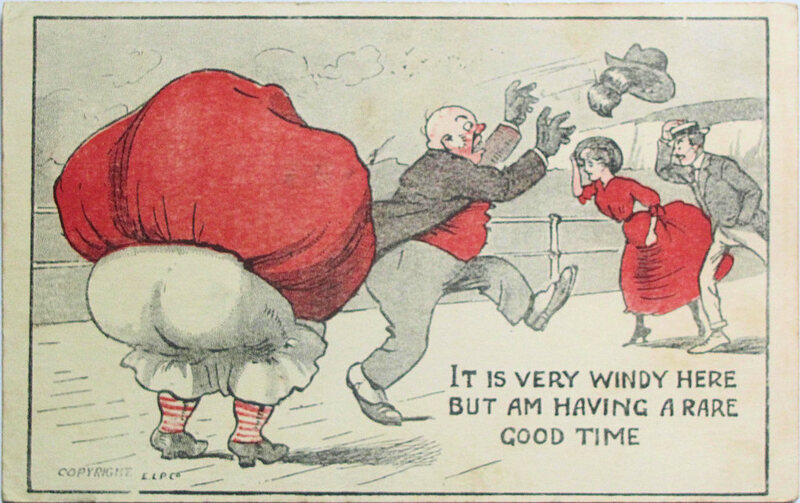 However so far I have discovered several versions where the image was redrawn to a greater or lesser extent. 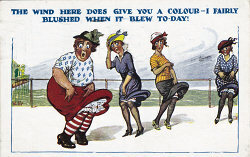 All are provisionally dated as 1908 or later and it may be that it is significant that in August 1907 the London View Company went bankrupt. 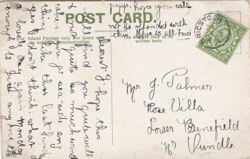 While the evidence is circumstantial the London View Company appears to have been a wholesaler who supplied "F S" cards with backs where the publisher name varied or was absent. 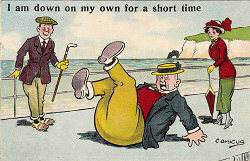 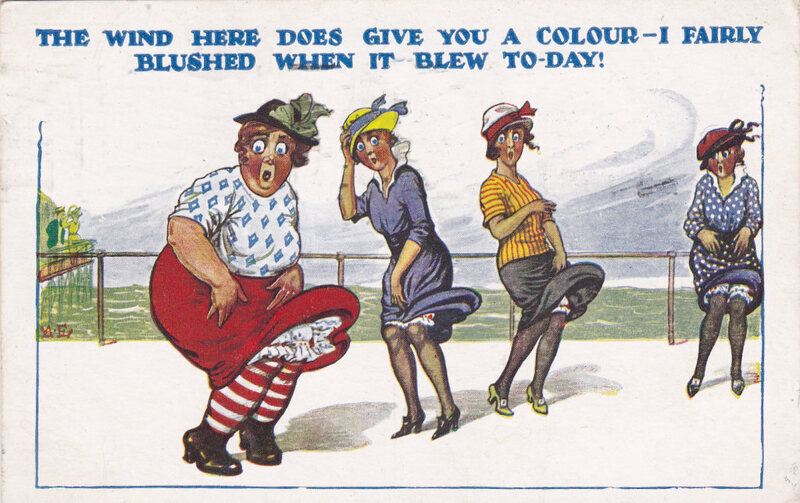 Companies who had been supplied with the "F S" cards in 1906/7 would therefore be unable to order additional copies for the 1908 seaside season and may have asked other artists to produce "something similar" believing the changes were sufficient to avoid copyright problems. 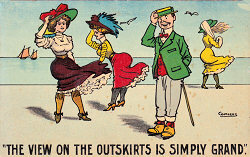 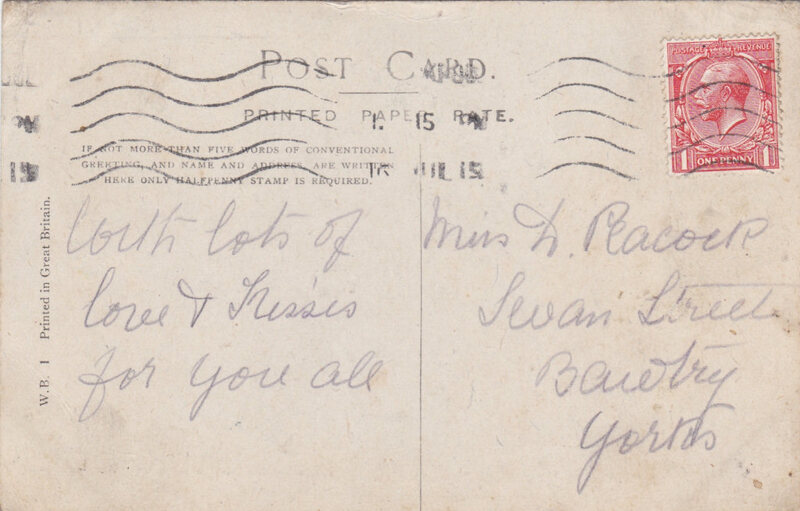 In every case the back is not one I associate with "F S" or London View CO. Ltd. post cards. 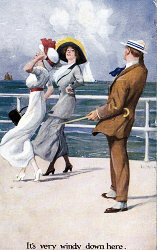 This redrawn version keeps the four original figures, but the further away lady is drawn facing into the wind. 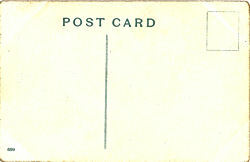 The card uses colour far more sparingly. 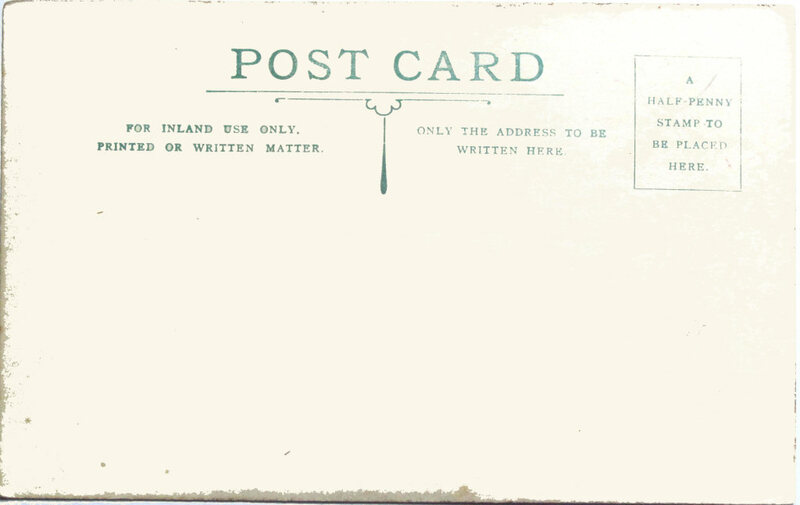 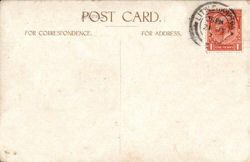 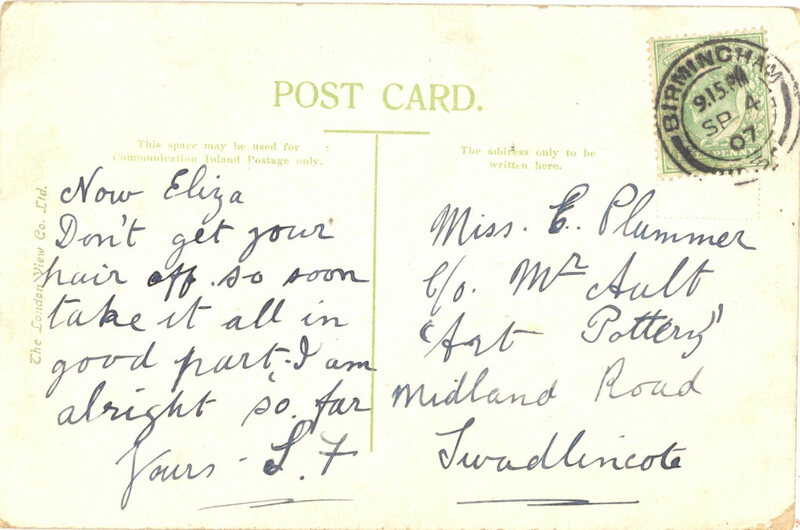 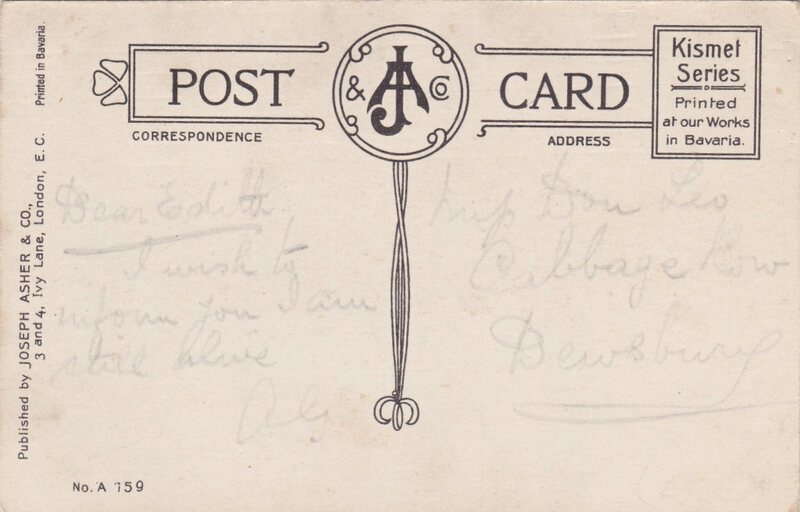 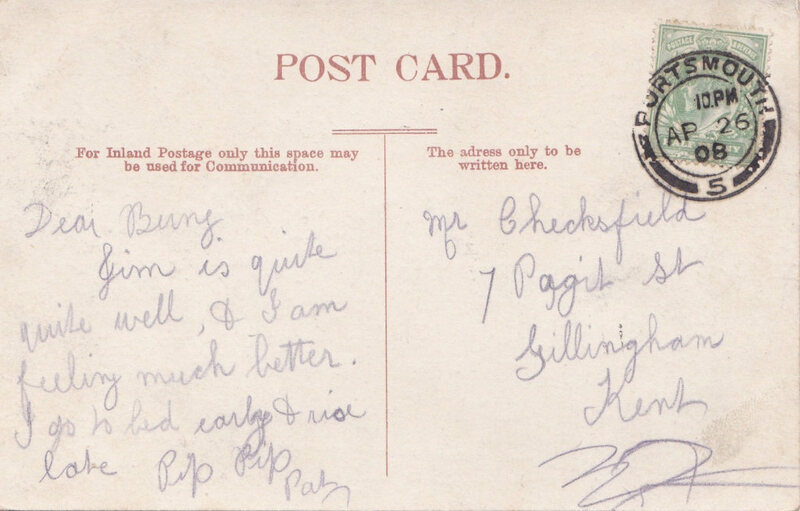 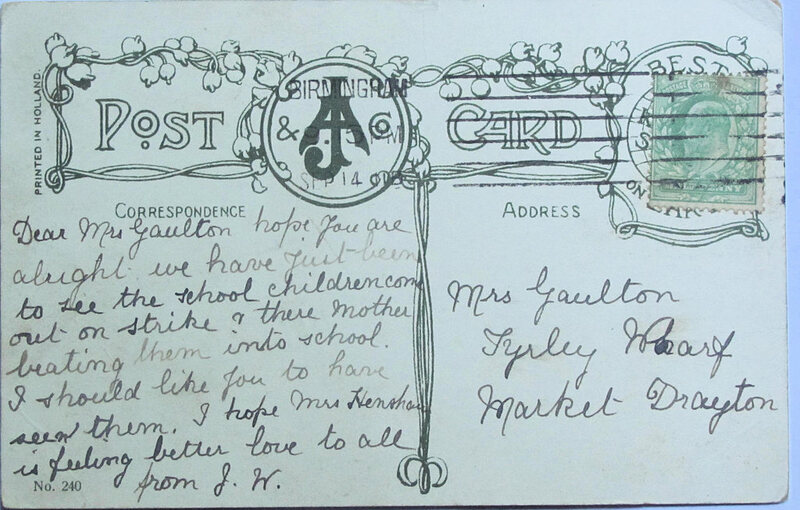 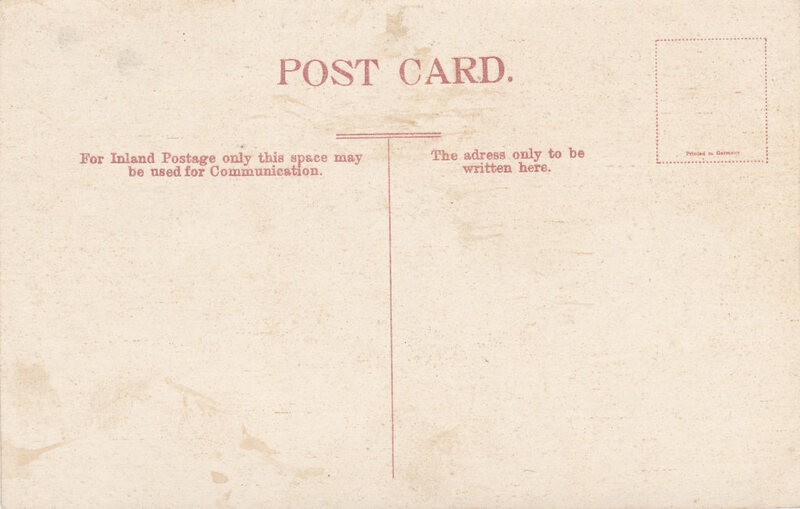 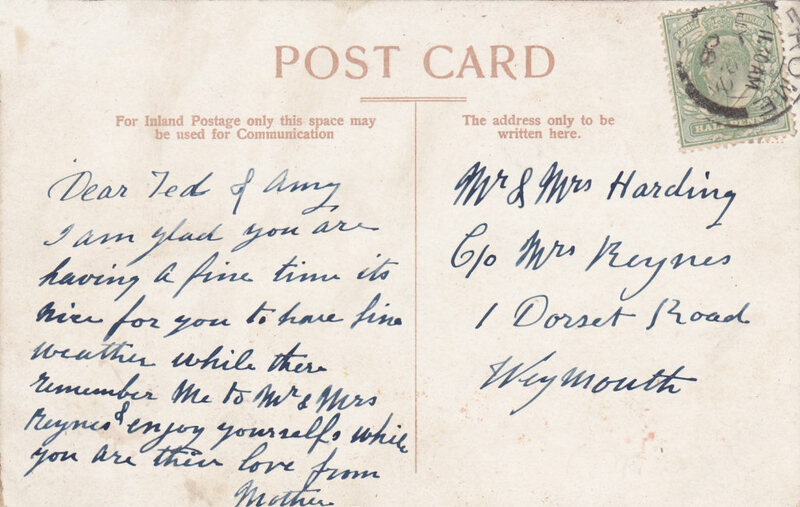 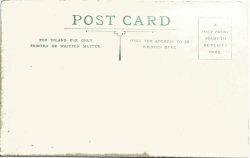 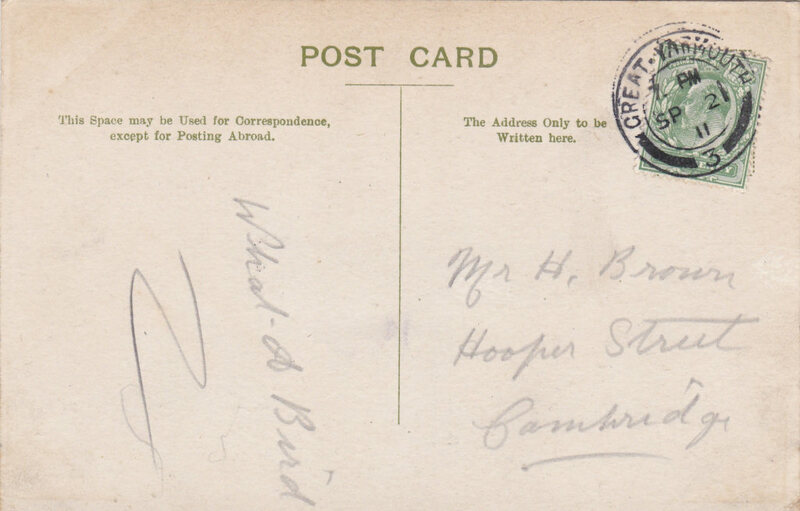 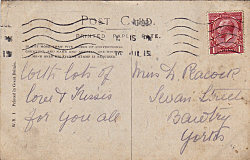 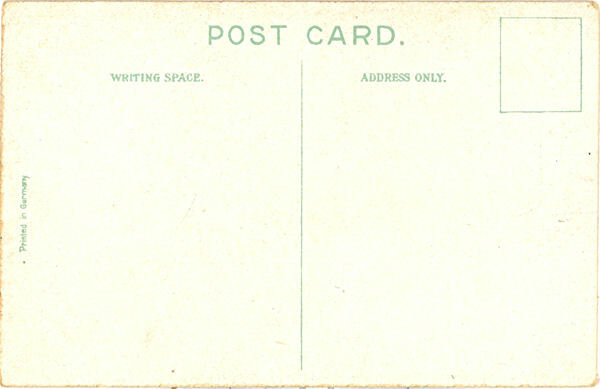 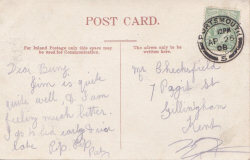 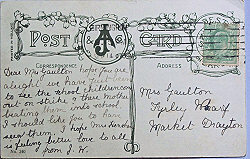 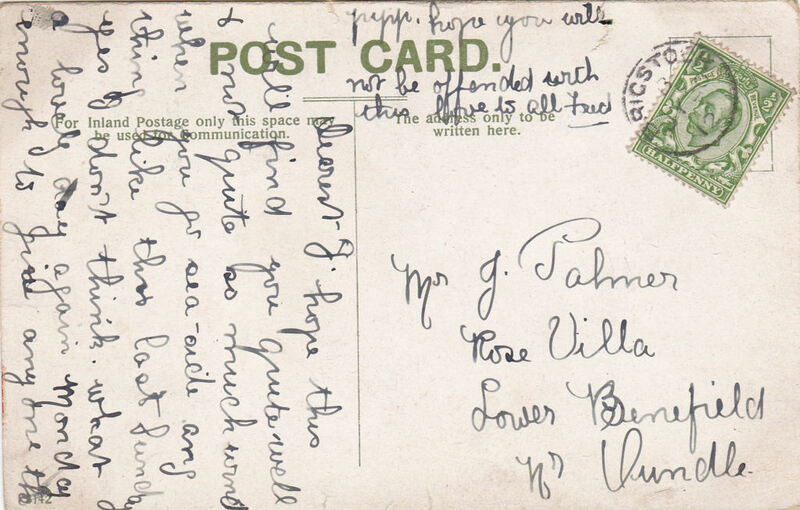 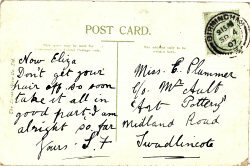 It may be a coincidence, but Anthony Byatt records that the East London Publishing Co was publishing post cards by 1908.and the E.L.P.Co on the picture side suggest that this was one of their earliest post cards. 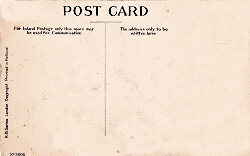 This raises the possibility that there was some connection between the failed London View Co. Ltd. and the newly formed East London Publishing Co. which did not include access to "F S" or his published cards. 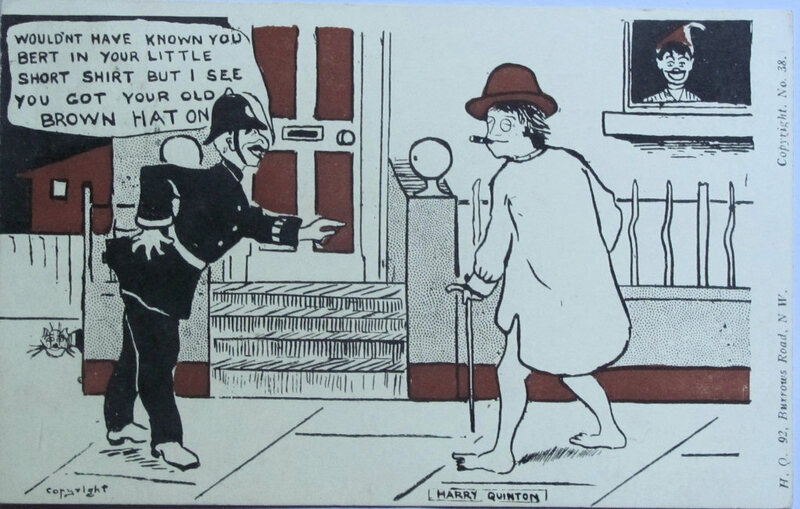 While there is no artist signature one possibility is Harry Quinton. 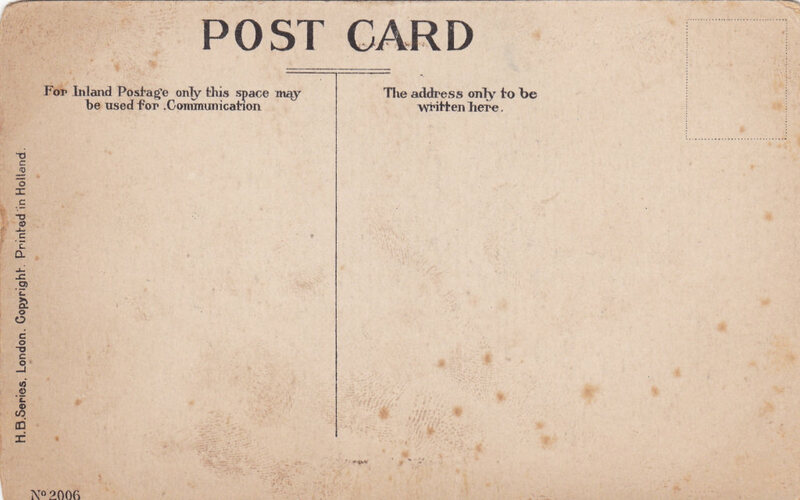 He was publishing cards in London over the period 1905 to 1907 using one colour and the same post card back. 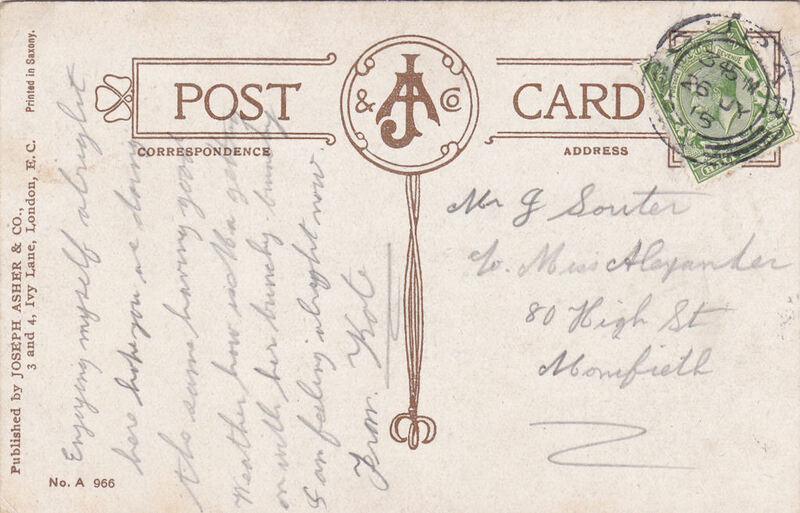 Joseph Asher was definitely selling "F S" cards in 1907, although there is currently no evidence that they sold any of the "Down Here" series with their company name on. 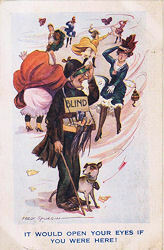 Donald McGill's first cards appeared in 1905 in the Empire Series (E S) for the Pictorial Postcard Company which closed down in 1908, and it was after this that he started producing cards for Joseph Asher. 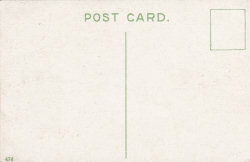 As far as I know he did not do any cards for the East London Publishing Co. 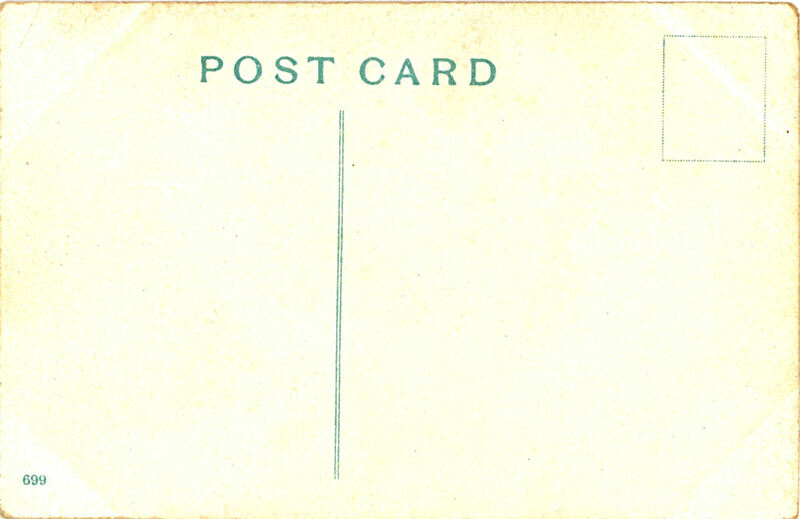 This would appear to be a modified copy of the "F S" image made by Donald McGill. 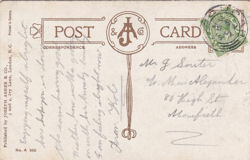 The card was posted in 1908 and this date fits in well with other Joseph Asher Series A numbers. 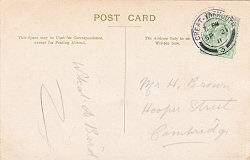 Published by Joseph Asher & Co. 3 & 4 Ivy Lane, London E C.
with no place name Posted 1919. 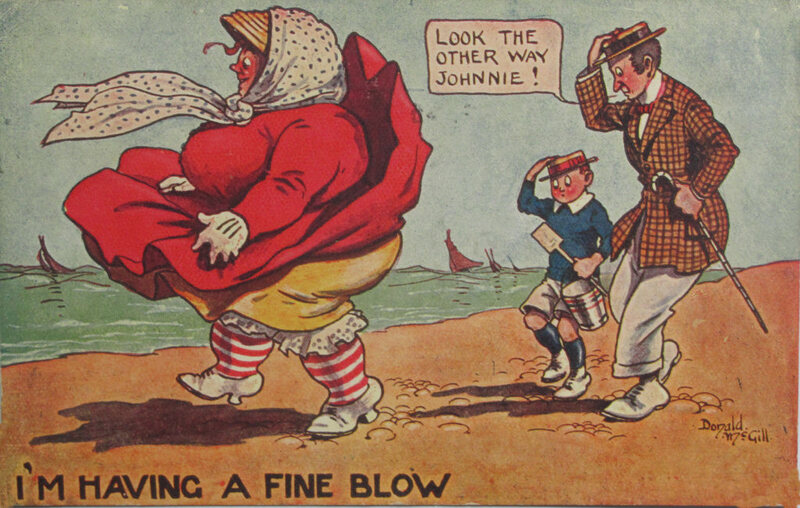 While clearly not a copy, Donald McGill was still drawing the same fat lady many years later and includes a similar man holding his hat on..
Harry Parlett, usually signed is name when designing cards for Gotteschalk. 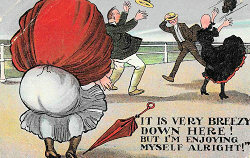 Dreyfus & Davis from about @@@ but also produced cards for other publishers such as Tuck, Hutson Brothers, the Midland Pictorial Company and A & G Taylor. 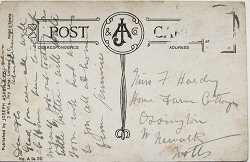 He sometimes signed his cards as "H P" or used the name "Comicus". 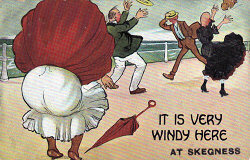 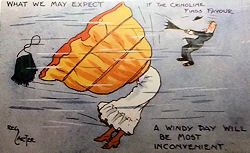 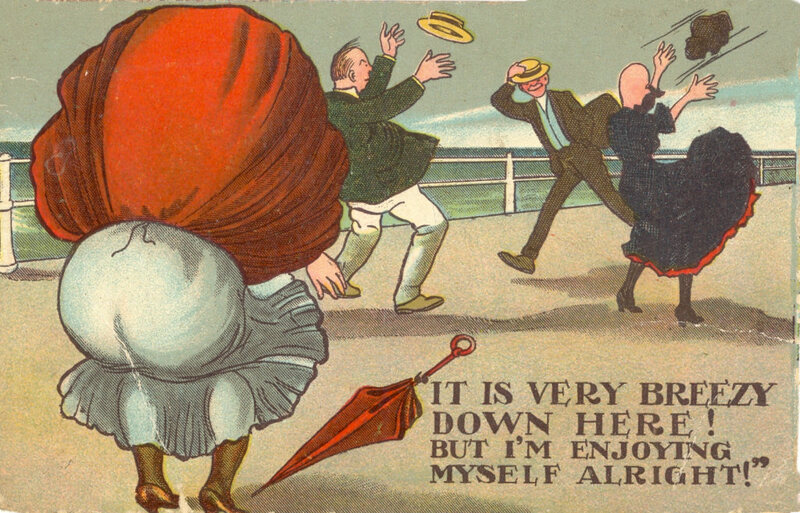 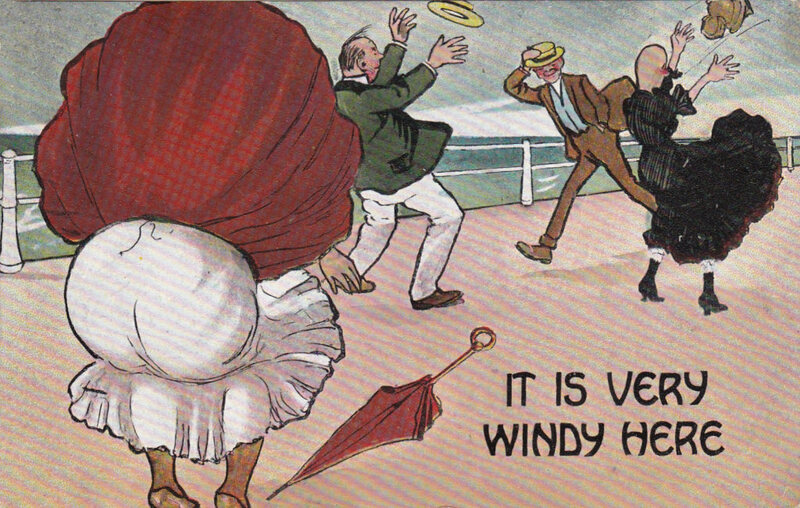 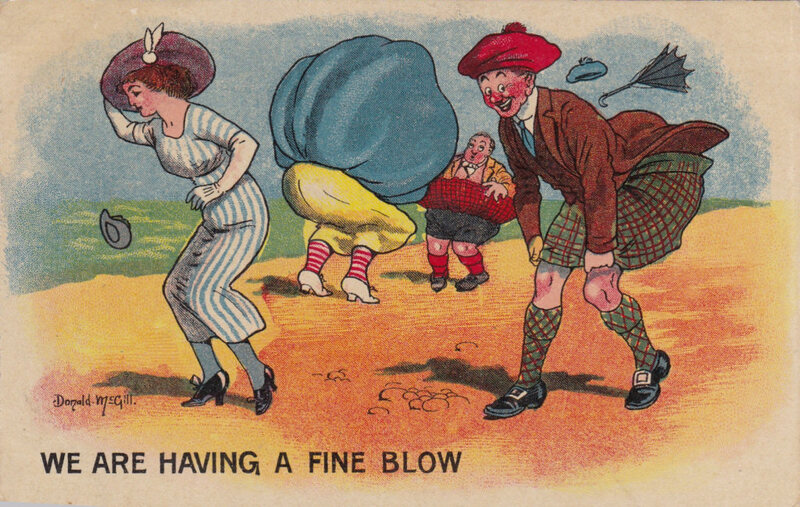 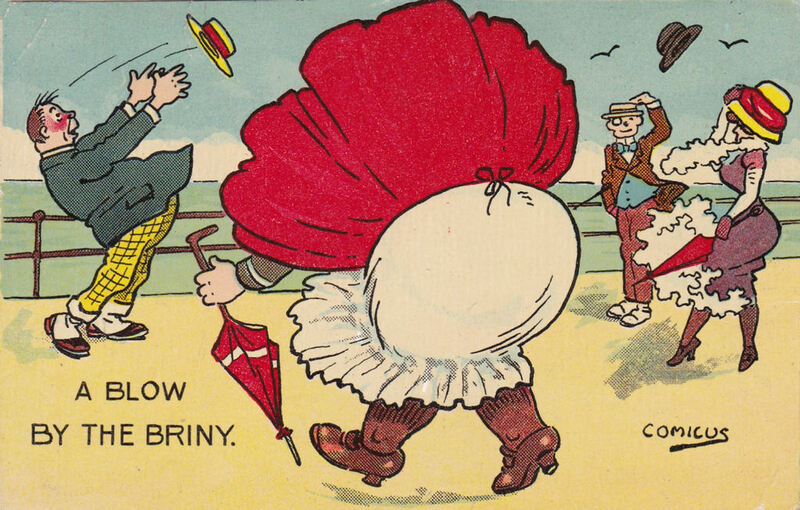 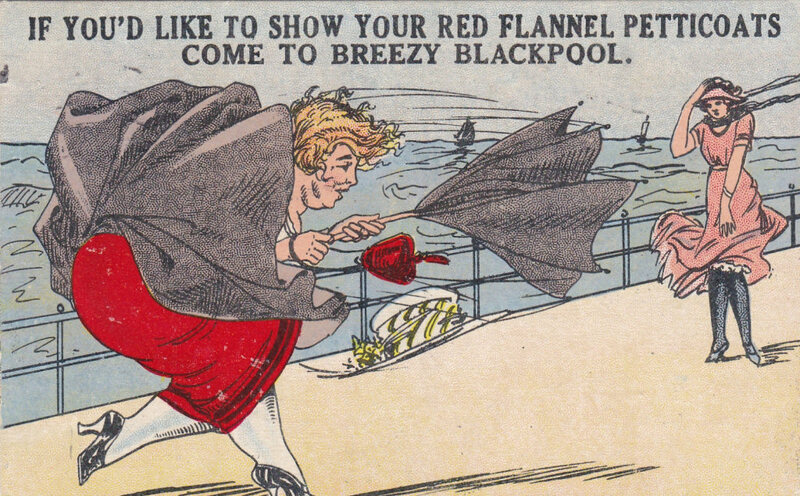 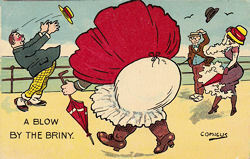 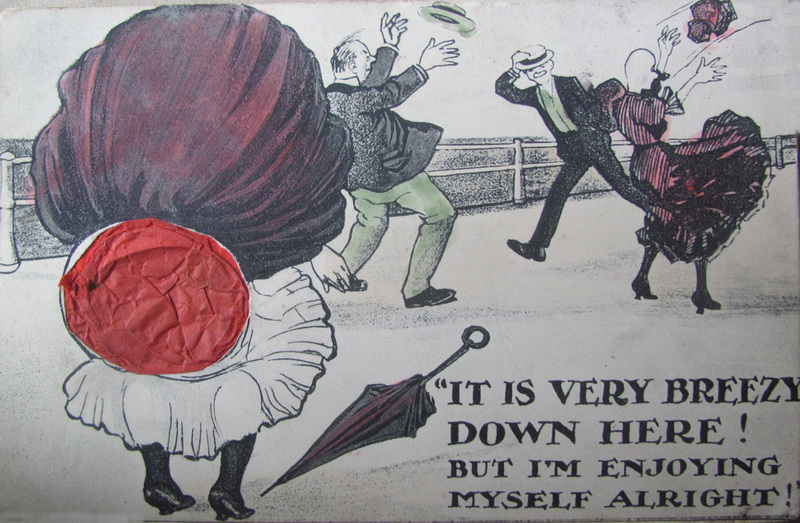 A Comicus version of "It is very Breezy"
This is clearly a copy of the original "It is very Breezy" card by "F S" which involves reversing the main figure so the wind is blowing the dresses in one direction and hats in the other direction. 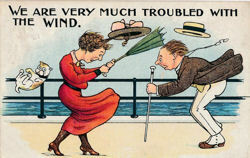 This suggests a rather mechanical copying to try and avoid copyright as anyone composing the picture would be actively aware of the direction the wind was supposed to be blowing. 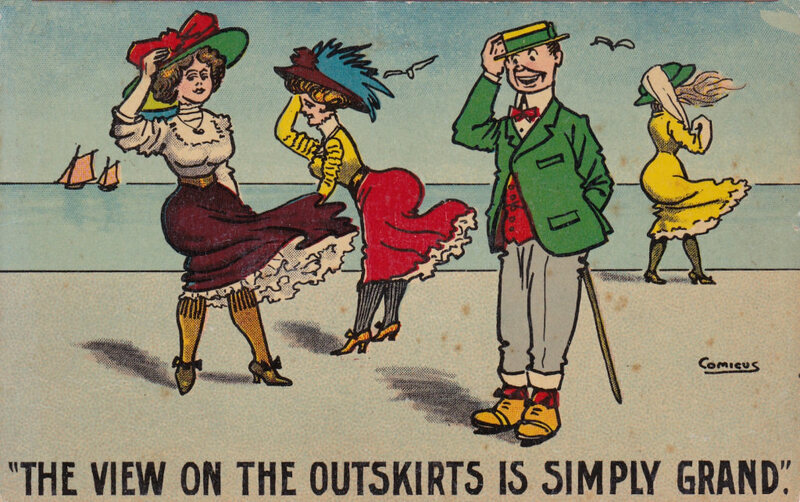 Despite the pre-1907 style back this is one of many Comicus cards, with identical backs and numbers in range 2904 to 3247 which were posted in 1912 or later. 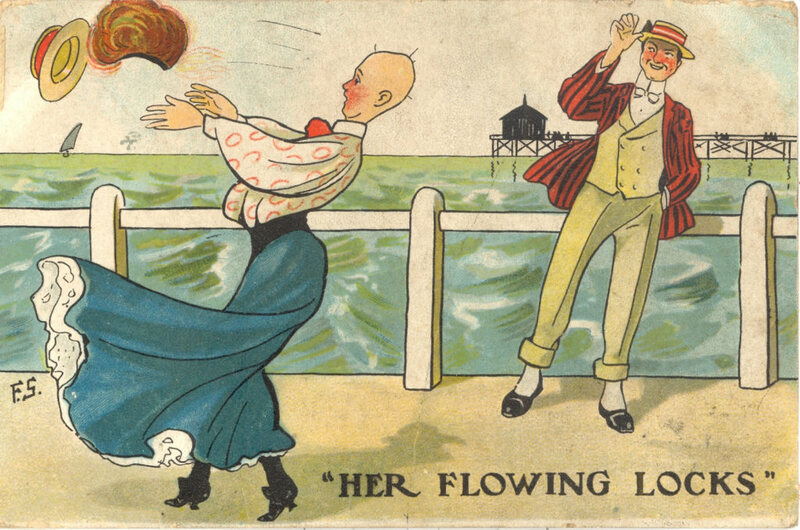 Some similarities with "It is Very Breezy" and "Her Flowing Locks"
Was Comicus also the artist for this card mimicking "F S" style? 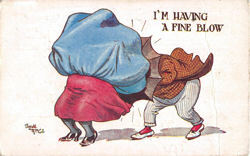 While this looks as if it ought to be an "F S" card - echoing two of his sets, the number puts it in a series of cards by Comicus or Harry Pallet (Comicus's real name). 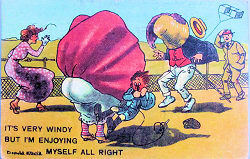 So could it be Comicus imitating "F S"? 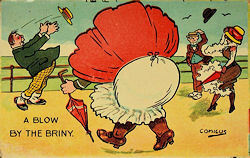 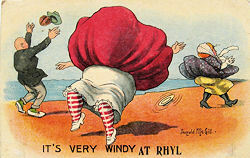 Well it is the same fat lady with her bright red bloomers - but the other figures are different. 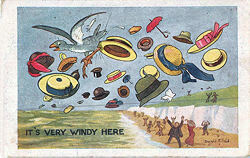 It's very Windy - I'm not making much of a show down here myself - but I'm seeing all there is to see. 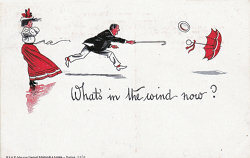 What's in the wind now? 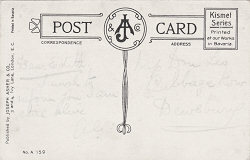 Some other post cards on a similar theme are included for comparison, showing the wide variety of ways other artists have tackled the subject without copying the actual figures. 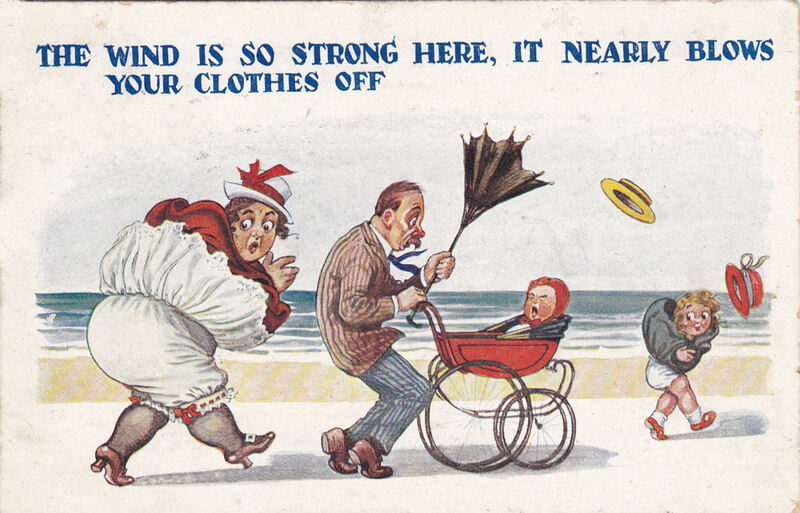 The wind is so strong here it nearly blows your clothes off. Series No 954 - No publisher info. 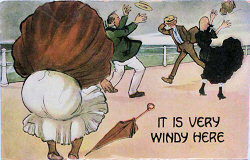 The wind here does give you a colour - I fairly blushed when it blew today! 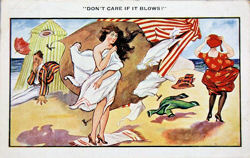 "Don't care if it blows!"